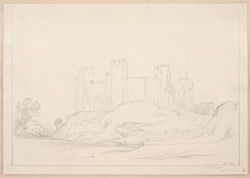 This lively drawing is of Framlingham Castle seen from the surrounding grounds. The imposing castle at Framlingham is early in style, possessing square rather than rounded towers. It was built in the 12th century and became the stronghold of the Bigod family, Earls of Norfolk. Roger Bigod, the 2nd Earl, was responsible for building the existing structure following the original castle's destruction in 1174. In 1553 the castle came into the ownership of the crown and became home to Mary Tudor on the commencement of her perilous reign. In the 17th century the site was bequeathed to Pembroke College in Cambridge on condition that a 'Poor house' be built, remnants of which can still be found.